Today we’re on hand with a little advice, to help you graduate from nervous learner to parallel-turning pro. It’s a long road, and you may even take the odd tumble, but the rewards make it all worthwhile! So read on for a few handy tips to help you enjoy your early days on the slopes to the full. Italy, France, Switzerland and Austria all offer amazing beginner-friendly slopes, but you don’t have to look that far for a little pre-trip practise. Closer to home, there’s a whole host of indoor or artificial ski facilities right here in the UK, ideal for practising before your big trip. * The Snow Centre is located in Hemel Hempstead — just outside the M25 — and is widely considered the best indoor facility in the country. * Manchester’s Chill Factore is home to the UK’s longest indoor real snow slope (180 metres). * The Cardiff Ski and Snowboard Centre offers a 100-metre piste and hosts skiing and lessons for all abilities. * The Plymouth Ski Slope and Snowboard Centre boasts three slopes, including the longest artificial slope in the southwest. * Snow Factor is a real-snow slope near Glasgow, with a 168-metre slope, ski and snowboarding lessons and tons of events. Deciding when the kids are old enough for their first trip to the snow isn’t easy, but one thing is for sure – the younger you start them off, the stronger and more confident they’re likely to become in the mountains. From speaking to the many ski schools we partner with, 3 to 4 years of age is widely considered a good time to introduce your little ones to the snow. 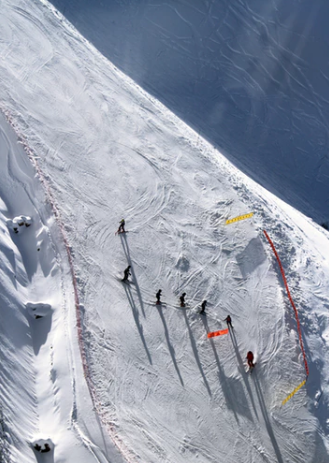 Most ski schools accept learners into group classes from the age of 4 and private lessons from age 3, but of course there are no hard and fast rules. For more food for thought on the subject, check out our blog on learning the slopes. Whether taking to the slopes in the UK or embarking on your first ski holiday, lessons should play a big part in your experience. The snow centres mentioned earlier in this blog all offer tuition to learners and improvers, and out in the Alps there’s a whole host of reputable ski schools with bags of experience in taking beginners onto the snow for the first time. Although worth every penny, skiing and snowboarding can be expensive pastimes. The basic kit of skis or snowboard, boots, goggles, gloves, jacket and salopettes, plus the holiday itself including flights, transfers, liftpasses and accommodation, means keeping an eye on the budget is key. Borrowing or renting kit, at least in the early stages, means you don’t have to commit to skiing or snowboarding until you’re sure you or the family are happy. You don’t know for sure you’re going to enjoy it, and there’s no point wasting money on kit you don’t end up using. If you’re prepped and ready for your first trip to the Alps and looking for a little resort inspiration, check out our blog on snow-sure ski resorts for families. And to chat over the best options for your next snow-filled escape, you can call us on 0203 0800 200 or reach us via our online chat service.